Enter to win a Kate Spade bag in our free handbag giveaway! Get ready for spring with this gorgeous Kate Spade handbag in maraschino color! Absolutely gorgeous! This chic handheld bag is crafted of pebbled leather with an optional cross-body strap and zip-around closure. By entering to win in our Pinterest Challenge this month, you’ll have a chance at the Grove Court Lainey Kate Spade bag. The bag measure 11 1/2 x 14 1/4 x 6 and is the perfect size for carrying this spring. It retails for $348! Enter to win in the free handbag giveaway now! Kate Spade is known for crisp color, graphic prints and playful sophistication. They offer handbags, clothing, jewelry, shoes, stationery, eyewear, baby, fragrance, tabletop, bedding and gifts. So, how do you win this gorgeous bag? Just take part in our Pinterest Challenge this month! I love Kate Spade. Thanks for the great giveaway! 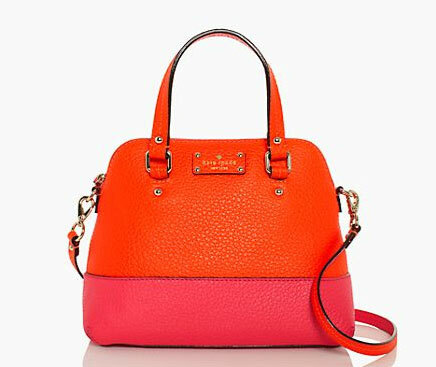 I love the gorgeous colors in this handbag and I would love to win a Kate Spade. I do love a nice Kate Spade. Now that I can’t work I cannot afford these anymore . Would love to win one. Made my board, now got my fingers crossed. Never owned a purse other than a walmart one. Got my fingers crossed!!! So cute! colors are incredible! i ♥ it!